Every now and again I look through bookselling websites to see the latest releases as well as upcoming releases. I enjoy reading the minute information shared about what the novel is about, and if possible, some reviews. There can be with some novels a chasm between those who loved the story and on the other end those who hated it. Now, it isn’t like that with all novels, even with some being written by the same author. Discovering lately there are vast publishing companies springing up, some publishers closing and others changing their format, which then opens up an opportunity for the author to revamp their work then republishing it. Recently, I was skimming the latest novels when I came across The Eye of Molech by Glenn Beck. The author’s name was familiar to me, but his writing was brand new. So, I took the plunge and ordered a copy as I enjoy political thrillers. Molech was an ancient god in the near east centuries ago in land where boundaries and kingdoms would change often. Beck’s first novel, The Overton Window, I haven’t read yet and the story started there is continued here in his latest work. Not having read the first novel made understanding the story a little hard at first, but within a few pages Beck shares enough of the background from The Overton Window to catch readers up so they can enjoy this second suspense-filled thriller. In an eerie way, much of the plot has been drawn from real life. At the end of the book, the author shares various sources to do further reading on topics brought up in a chapter. Some can see the writing on any wall as plain as day while others claim ignorance in not seeing it or in choosing to not see it. Here, in the writing, characters are drawn into situations that call for heroics from everyday American citizens. Molly Ross is a praying woman who wants to do what God has called her to do regardless of the price. In some ways, she reminds me of Queen Esther. Other characters have hidden agendas or very overt ones. The whole plot centers on undermining the Constitution of The United States of America. The call going forth is to wake up and become informed, involved and committed to the domestic or foreign aggressors. While there is some mild use of foul language, I really got engrossed in the story with each page I turned. 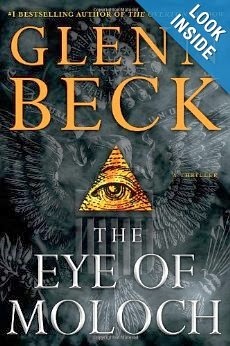 Glenn Beck does an excellent job of various twists and turns in the plot that the reader will not want to close the book until the end! Contained between the covers is an emotional and heart-wrenching set of scenes filled with action and adventure. I hope you take time to read this work, just remember there is mild use of swear words but none that detracts from the patriotic theme! My rating is 4 ½ stars.